The thermostat comes down to just $199 after the discount. This is the latest revision of the device, and at the moment it's available in steel, white, copper, and black finishes to match your home's décor. The Nest Cam is discounted to $149, and that price is good whether or not you subscribe to the Nest Aware cloud video storage service. The Nest Protect isn't being offered on its own at a discount, unfortunately - to get the lower price deal hunters will also have to buy two LIFX connected light bulbs, which can work with the Protect as secondary alarms (with flashing lights) and work with the Nest thermostat and other connected gadgets for standard lighting control. The bundle, normally $198.98, is down to $148.98. White and black options are available. 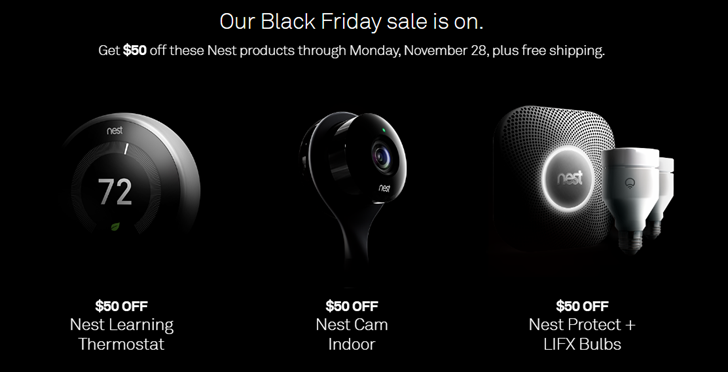 Orders of over $100 on the Nest store get free shipping, and at the moment everything is shipping out in one business day. These prices are good through Monday, November 28th.